With the help of PST to MBOX Converter tool, you can import MBOX file to Apple Mail, Eudora, Thunderbird, Pocomail, Spicebird Mail, Entourage, etc and many more. Effortlessly transfer all mailbox data from Outlook PST to Thunderbird MBOX file format. Data items like Inbox, Drafts, Sent Items, etc. can now be saved in .mbox file. This file can then be imported to Thunderbird. This way all the emails from Outlook will be exported to Thunderbird. Easily convert PST to MBOX in Windows 10, 8.1, 8, 7 versions. Use Outlook to Thunderbird Converter to easily move data between email clients. All the messages are saved in exactly the same folder as they were in the original .pst file. There is no data loss or changes made to emails during the transfer process. A single .mbox file is created for each .pst file. Just upload the file and perform the conversion process with an ease. It is a user-friendly software that can be used by both home and business user. Even a non-technical person can use the software panel with ease. There are easy options and simple buttons that enable users to try the application at least once. 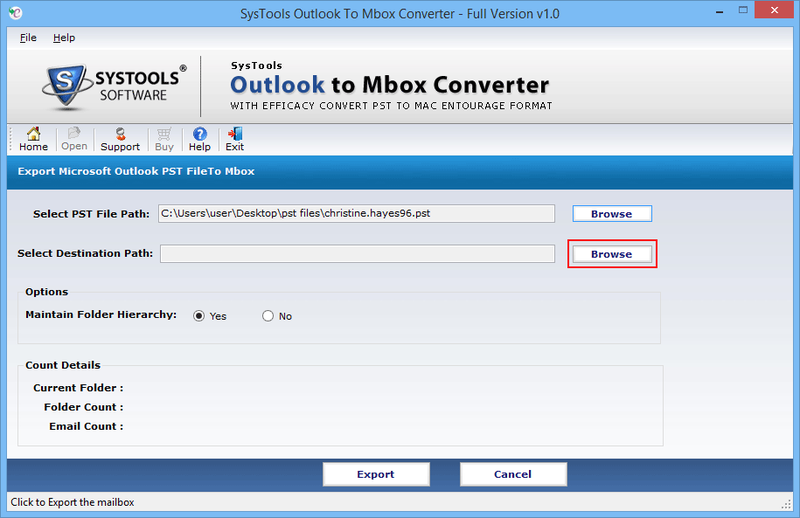 Convert PST to MBOX Thunderbird with the click of a single button. PST to Thunderbird Converter tool has a feature to view a number of emails per folder. The item count of each mailbox folder within the PST file is displayed on the software panel. This option emerges as soon as the PST file is uploaded into the tool & Export button is clicked from the navigation bar. Use PST to MBOX Converter tool to completely transfer Outlook emails to a .mbox file. This file can then be imported to any of the different desktop based email clients available in the market. It can be used with Thunderbird, Eudora, Apple Mail, Entourage, and much more. There will be no compatibility issues and a new folder for the Outlook files will be created within the new email application. All email properties like header and body are in the exact same manner as they were in original mailbox. Email body is in perfect formatting as in the original message. The email header contains important information like to, cc, from, bcc, sent date, received date, server information, IP address etc. These all are kept intact during transfer by PST to Thunderbird Converter Software. I am new to the desktop-based email client. I was using Outlook 2013 for communication at my workplace. Now, I want to transfer some of my important conversation to my personal desktop computer. I do not know how. Could you guide me on how to transfer emails from Outlook to Thunderbird? 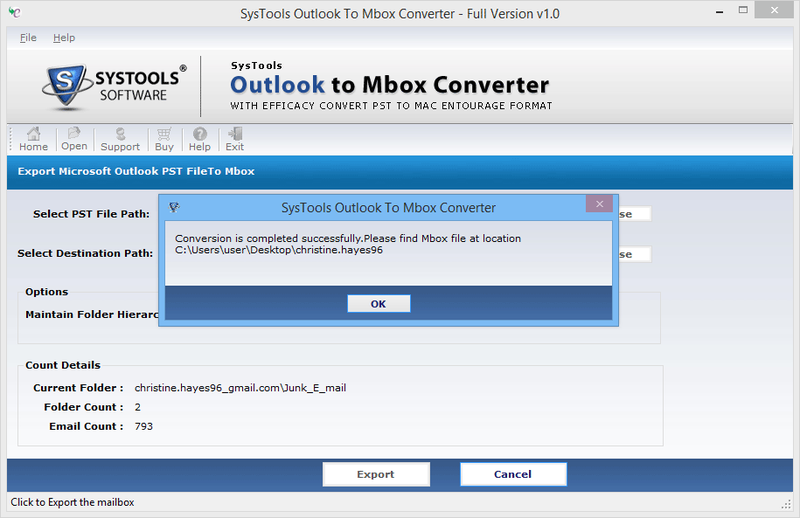 The PST to MBOX Converter software can migrate data from any of the Outlook version including 2013. It is compatible with Microsoft Outlook for 32-bit as well. A POP3 account must be configured on the machine using this tool. To transfer emails from Outlook to Thunderbird, locate the .pst file from the Outlook Mail folder or search using a folder explorer. Next, use PST to Thunderbird Converter to migrate emails from PST file to MBOX file. After that, use the Thunderbird Importer to Import MBOX File into Thunderbird account. Now, view all the contents of the .mbox file in the Thunderbird. They will be in the same exact manner as they were in original Outlook mailbox. I have a Windows XP computer. I have just bought a new MAC computer that runs on Mac OS X. It is an upgrade to what I was using earlier. I want to move my emails from my old computer to the new one. How can I transfer Outlook emails to Apple Mail? This PST to Thunderbird migration tool can help transfer emails from a Windows system to a Mac computer. Firstly, go to MS Outlook >> File >> Import >> Outlook for Windows Data File(.pst) on the Windows system. 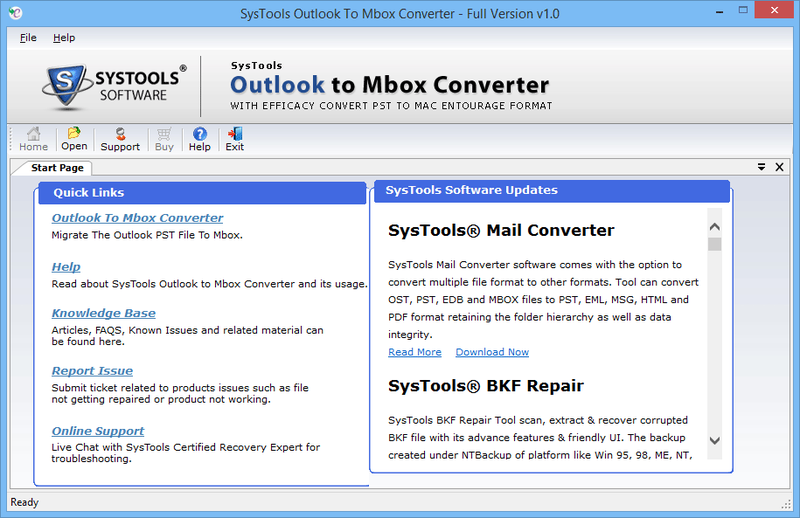 Next, use Outlook to MBOX Converter tool to transfer emails from PST file to MBOX format. Now, launch the Apple Mail application on the Mac computer. From there, go to File >> Import Mailboxes. Then, choose File in MBOX Format from the list and then click Continue. Next, Browse to the folder path where the .pst file is saved and click Choose. Now, the emails will be added to Oh My MAC folder on the left pane of Apple Mail application. How does PST to Thunderbird Converter Work? Demo Version of PST to Thunderbird Converter Software allows User to Export First 15 Emails from PST File to MBOX Format. MS Outlook (32 bit) should be installed & configured for a valid or dummy POP3 profile (Not Configured for Exchange). Explain the functioning of PST to MBOX Converter Tool? Step 1: Install & run PST to Thunderbird Converter Tool. Step 2: Click on Open button to start the conversion process. Step 3: After that, browse the PST file and select it. Step 4: Now, browse the destination location to save the output MBOX file. Step 5: Apply settings to maintain the folder structure and then proceed with Export button. Step 6: The software will show item count details for exported data items. Step 7: After completing the export process, navigated to the location where you have saved your MBOX file. Now, you can import that file to any email client to access your data. Can PST to Thunderbird converter migrate multiple .pst files at a time? No, the Outlook to MBOX conversion algorithm can not transfer emails from multiple files at once. Can the tool also transfer contacts or calendar items during export? No, the PST to MBOX Converter tool can only transfer emails. It is not meant for contacts, calendars or any other mailbox data items. Could the conversion algorithm also transfer emails from a password protected file? No, the Outlook to Thunderbird migration tool is not meant to remove passwords from the protected .pst file. Can I recover lost or deleted emails from this conversion tool? No, The PST to Thunderbird conversion software cannot handle corruptions is a .pst file. Neither can it recover lost or deleted emails. Is there a need for MBOX email client to be installed on the machine where the tool is? No, email clients that support .mbox file format are not needed for the conversion. Outlook is required to be installed on the local machine. "Hi! It is very easy and user-friendly product. Not much is needed to download and try this software. I can easily manage my conversions from a single panel. It is quite effective and reliable tool. I was simply amazed by the results after using this PST to Thunderbird Converter Free. Emails were in perfect condition even after the transfer of over five thousand emails. Thank you!" "It is a great tool for migrating emails from Outlook to Thunderbird. I simply uploaded a .pst file into the PST to MBOX Converter Software and export started immediately. The MBOX file was created almost within seconds. I simply imported that file to any of my different desktop email applications that use .mbox format. Kudos to the development team for creating such a great product!" 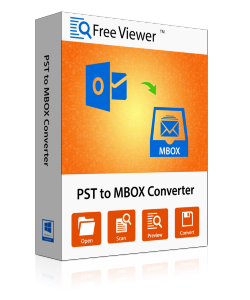 "PST to MBOX Converter is a great software that can easily convert Outlook PST file to Thunderbird MBOX file format. This file is not only compatible with Thunderbird email client but also with 20+ email applications like Eudora, Entourage, Apple Mail, Spicebird, etc. It provides flexibility to migrate data from Outlook to many other email applications. I am impressed with PST to Thunderbird tool. Great work, FreeViewer!" "I bought an Apple laptop and my emails were in Outlook email application on Windows. I want to migrate from Windows to Mac. I don't know how to get back all the emails from PST to MBOX. Then, one of my friends suggested me to use Outlook to MBOX Migration Tool. After using this application, I was able to get all my emails on my Mac machine."